Today I'm sharing a recap of our weekend in Chicago. Cort and I love to go on little weekend trips to get away, even if we're not traveling super far. We always come back feeling so refreshed and it's a great change of pace from our day-to-day. This trip was a littleeee different for a couple reasons. One, I'm in a boot for a stress fracture, so we were a little worried about how much walking I would be able to do. Two, we are doing Whole30 so we wouldn't be able to indulge in our usual Chicago favorites and we had to put a lot of thought into finding restaurants that served Whole30 approved foods. We knew this trip would be a tad more complicated and we needed to get creative about what activities we could do and where we would eat. Cort and I love being on the water, so I had the idea of Kayaking. It was perfect because there was obviously no pressure on my foot, but it was still something active that we could do in the city. We rented Kayaks through Wateriders and absolutely loved it. We've never done something like this before so it was so fun to do something different. First of all, the views were absolutely incredible. 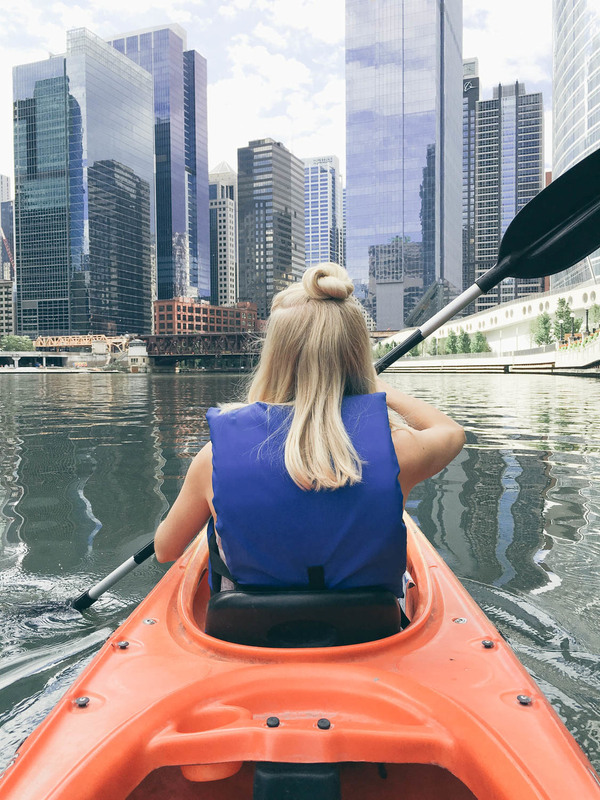 You kayak right through the city on the Chicago river. We opted for a self guided tour so we could take our time and not rush... you know, gotta snap some selfies and gawk at the buildings like a tourist :) The staff was so friendly and hilarious and our instructor looked and sounded exactly like James Franco. They gave us a little lesson before we went out, because guys, kayaking is a workouttt!!! I was feelin it in my arms (Cort did most of the work though). You can rent individual or double kayaks. We opted for the double so we could talk and not have to worry about me drifting away because I couldn't keep up. 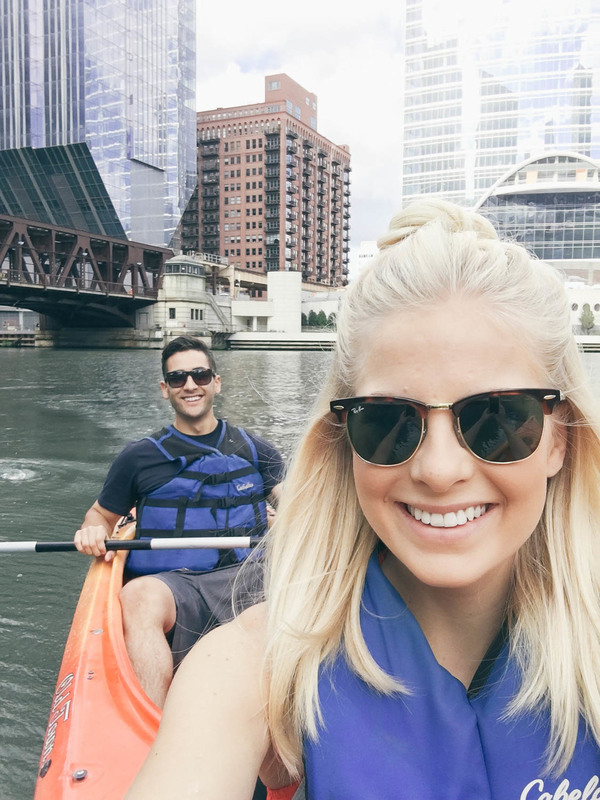 This was definitely our favorite part of our trip and I highly recommend kayaking with Wateriders if you're planning a trip to Chicago. Lots of pics from our adventure below. Keep reading for where we ate and what else we did! We went to an amazing juice shop called Real Good Juice Co. Cort got the Kale E Kopowski and I got the Silky Smooth Sounds of Sonny Sanderson's Saxophone... those names though..
We ate at Butcher and the Burger for dinner which was so tasty and then we walked along the river walk. A lot of you guys asked me about this shirt... I'll do a blog post with it tomorrow! 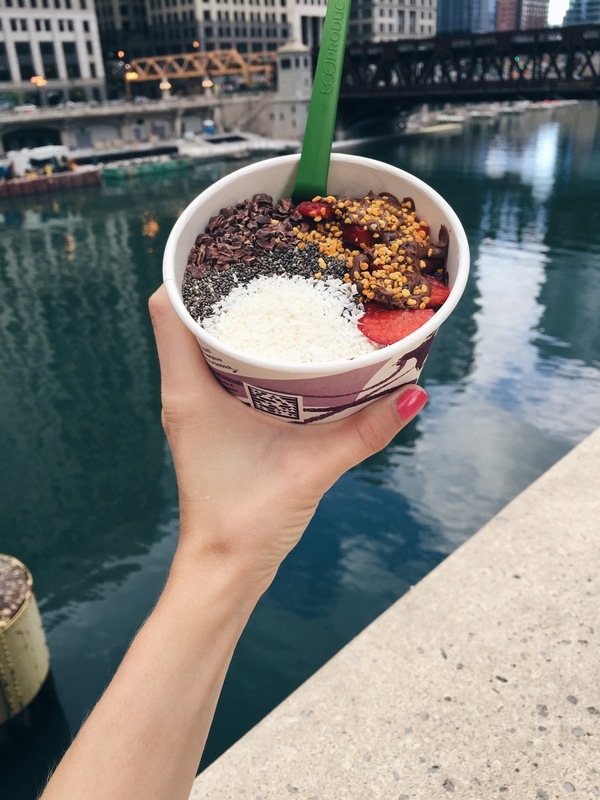 We found these awesome Acai bowls at Hi-Vibe Superfood Juicery for breakfast on Sunday. We did lotsssss of shopping! I was so proud of Cort because he was actually really into it and wanted to go! He even bought some cool new clothes. HUGE End of Summer Sale!